Proper Socks pair workday styling with workout performance, giving your business attire a splash of panache while caring for your feet. Justin Schachner created Proper Socks—the world’s first performance dress socks—after his feet suffered from 10+ hour days at his consulting job. An avid runner used to the cushioning and comfort of athletic socks, he wanted those same qualities in his business hosiery. When he realized no such socks existed, he invented his own. Made from a breathable, conforming blend of cotton, polyester, and spandex, each pair of Proper Socks features a right and left sock, with targeted toe and arch support anatomically designed for each foot. Mesh fabric surrounds the toes with improved ventilation and lasting comfort, while two-ply padding throughout the heel, toe box, and side provides cushioning against everyday impact. Even with all this athletic technology built in, Proper Socks are only slightly thicker than traditional business socks. Available in your choice of six colors and patterns, Proper Socks are as good a fit for your work wardrobe as they are for your feet. Spending 12+ hour workdays in my typical, unsupportive fashion socks always took a toll on my feet, and the moment I took off my work shoes at home was one of the best parts of my day. One evening after slipping into a pair of my high-performance running socks to soothe my feet, I wondered why my dress socks didn’t have the same technology. With that, Proper Socks was born! We’re so excited to be here and look forward to answering any questions you may have. Have you tried standing in these for an extended period of time Justin (for example a 10hr Tradeshow)? We're a fellow maker on The Grommet and these could definitely come in handy during our show season. I have spent most of past year in various prototypes and the final product and they really do help when you're on your feet for extended periods of time. Also, the orthopedic surgeon what did my ACL reconstruction raves about them, and I know from personal experience that he spend hours on his feet. Are you going to produce any in women's sizes? Amy from The Grommet team here. This is Justin's first product and as he receives more feedback from supporters like yourself, he'll adjust his product offering. A women's version is a great idea and I wouldn't be surprised if that's next on his list. Sheri, Amy is 100% correct that I'd love to expand my product line in future. I don't need to tell you that women have it way worse than men when it comes to foot comfort. For the time being, we're just a men's line, but hopefully in the near future we can add a women's collection. @Justin I would definitely buy at least 6 pairs if you design socks for women. as I stand on my feet all day and good socks that don't bind are hard to find. The price you have listed is comparable to Smart Wool socks. @Justin Hi, I agree! Womens' line, please!!! @Justin I currently buy men's socks even though they are larger because they have more toe space. As long as the heel and arch stay put, I don't really care if there's a little extra on the toe. Would it work for a woman's size 9-91/2? Unfortunately the answer is "they may". Sheesh, I'm such a consultant. Anyways, I'm going to guess that they would work. We've had a men's size 7 sporting his for almost a year and he loves them. My only concern would be the heel color showing, but if you're wearing them with boots, that won't be a problem. Hi. I too would love it if you had a women's style with no band at the ankle. I am also interested in sizes for women. Thank you. @Keith When you make the socks for women PLEASE include a size for women who wear a size 10 shoe. Thanks. Looks, like there is a lot of support out there from the ladies! If we're lucky enough to keep growing, we'll definitely look to expand and produce a women's line. Women definitely have it worse than men, so the need is obviously there. @Justin - Add me to those who would love a women's line of these with no calf band - I wear a 10 and my mother-in-law and sister-in-law wear both wear size 11, so we need these for large footed ladies, as well as large footed men - my hubby wears a 13-14 and socks seem to be small on him in general, so he would appreciate a larger size or more size specific sock. These are a great idea!! Can you tell I'm excited about these! Thank you! Do all these socks go over the calf? 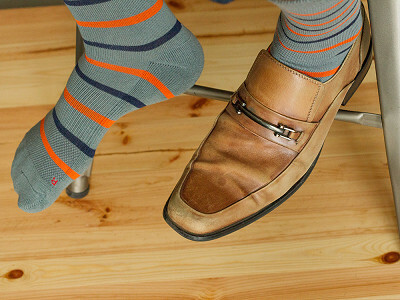 Proper Socks are designed to go up, but not necessarily over the calf. 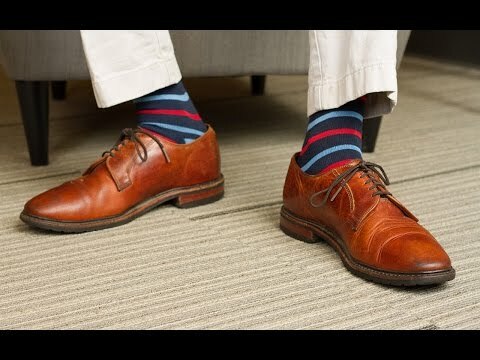 Depending on the customers height and foot size, some men are able to wear Proper Socks above the calf, but most men wear them right up to the calf. This helps the stay up a little better than most of the competition. When ordering it says buy three pairs and get them for $12 each instead of $14 each. When I place the order the system isn't giving the discount. In order to get them for $12 each does it have to be three pairs of the same socks or can we mix and match pairs? It'd be a lot cooler if we could mix and match and get the discount!!! **The Grommet note: Buy 3 for $12 each was a launch day promotion and is no longer valid. Like the idea and would buy them, but color combinations and selection need to improve. The great thing about being a small company is that I'm open to feedback. Keep these ideas coming and let me know what designs you be interested in. I can't make any promises, but maybe you'll see one of your suggestions in next year's collection. Would love to see colors that would go with tans and browns. Great product. We've had a couple of similar requests and we'll definitely be producing a few designs that work with tan or brown pants in our next collection. I may have missed it, but is this a one size fits all thing? I wear a size 14 in dress shoes. Will these socks fit properly? No pun intended. This information is listed in our details portion. When you click on the box that says "buy" in orange, you'll see even more pertinent information. These socks fit sizes 10-13 for men. Justin may jump in here with some further insight on whether a size 14 is pushing it. At size 14, you should be OK. We've had numerous testers with size 14 feet and we haven't had anyone say they don't work. That said, they may not reach as far up your calf. We have a 100% guaranteed return policy, so if they don't work, we'll gladly take them back. Hope that helps. How about guys with smaller feet? I wear an 8 1/2. I myself sport a size 8.5. I will admit that with smaller feet, you may notice the heel color from time to time, but more often than not, you won't see anything. All the pictures on our website are of me in the socks. Feel free to give it a try and if it doesn't work, I'll gladly accept all returns. As you'll see above, this is the first product from Justin and as he gains more feedback, he'll work on more offerings. Thanks for your input. 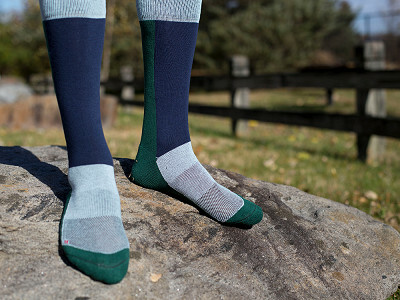 Our sock's combination of elastic, nylon, and cotton make them stretchier than most. At a 14.5 I can't guarantee they'll fit, but if you want to take a chance, please know that we honor all returns. any known benefit for guys who stand in boots all day? I'm thinking they'd be comfy, but would being in a larger shoe defeat the breathability and/or wear them out faster? Good question, Emily. Let's see what Justin has to say on this and I will gather some feedback from the men in our office who have tested them. More soon. @Amy @Emily Matt from The Grommet here. I love nice socks, and have several pairs from different stores. They all typically get a hole on the toes and start to rip after only a few uses. I have worn my Proper Socks several times in sneakers, boat shoes, desert boots, and work boots. They have not only stood up to the test, but have been the most comfortable sock I have worn compared to my other dress socks. When in my work boots, they still felt great and are in great shape. To add to Matt's comment, my original sample pair from the factory is still going strong and they've been worn at least 50 times over the course of a year and a half. No holes yet! @Mary Jane Hi Mary Jane. If you look at the image on the video, that is one of our Grommet employees wearing the socks. You can see that the socks fit well and he is a size 9 foot. While the sizing we have listed is a starting point, we believe these socks have enough give and stretch that they will be comfortable for sizes smaller than 10 and larger than 13. I'm an 8.5 myself and actually I'd be an 8 if I didn't have weirdly wide feet. But enough about my feet. We've had testers down to a size 7 wear them comfortably. Feel free to give the a whirl as we never haggle over returns. Too bad they are made in china.... I feel like a traitor to all the unemployed Americans when I buy Chinese stuff. While I'm also a big fan of American made products, there were several factors that led to our sourcing our socks from China. The first contributing factor was the lack of interest we received from American manufacturers. We reached out to more than a dozen U.S. manufacturers and were deemed too small for their interest. The second contributing factor was our unique pattern. The few manufacturers that did respond back to us were concerned about the R/L foot specific pattern. That's when we decided to look abroad. @Justin 100% agree with what you said, Justin! I'm a faithful "Grommeteer," but it burns me up to see AMERICAN entrepreneurs like yourself taking a lambasting from these "I don't support Chinese anything" people. Really? Do you drive a car? Watch TV? What about the computers and/or cell phones you're so happily typing on, folks? Would you be willing to boycot any of THOSE items because of having parts or components made in China? What about your clothing? 100% of everything I just named has parts and almost 100% of them are made in Asia and/or China! Everything about The Grommet supports AMERICAN small business and citizen-commerce. You heard the gentleman--he TRIED to get this sourced here! Our companies weren't interested in his product. He's yet too small. That's the difference in the Chinese work AND production ethic. You take THEM a product, they'll find a way--no matter how big or small. Not so here, which is one of the greatest reasons our economy is in the shape it's in. I digress. Many of the people who bring their new products to The Grommet's table have literally put their entire lives on the line to start up a business. They've gotten loans, mortgaged their homes, etc...all in the ideation of starting a company here in the USA, to employ AMERICAN workers in the end. Proper Socks pair workday styling with workout performance, giving your business attire a splash of panache while caring for your feet. 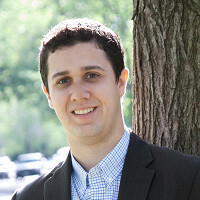 Justin Schachner created Proper Socks—the world’s first performance dress socks—after his feet suffered from 10+ hour days at his consulting job. An avid runner used to the cushioning and comfort of athletic socks, he wanted those same qualities in his business hosiery. When he realized no such socks existed, he invented his own. Made from a breathable, conforming blend of cotton, polyester, and spandex, each pair of Proper Socks features a right and left sock, with targeted toe and arch support anatomically designed for each foot. Mesh fabric surrounds the toes with improved ventilation and lasting comfort, while two-ply padding throughout the heel, toe box, and side provides cushioning against everyday impact. Even with all this athletic technology built in, Proper Socks are only slightly thicker than traditional business socks.